You may have noticed over the years that the naming of property sets in Revit has changed from version to version. 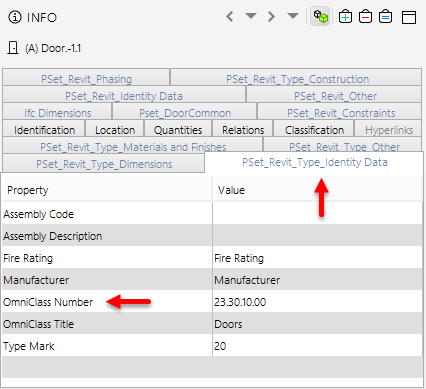 For example, in a model exported from Revit Architecture 2011, the property “OmniClass Number” is located in the “PSet_Revit_Type_Identity Data” property set. All doors do have this property defined in each version of the model; however, in the screenshot below, you can see that this rule fails for all doors exported from Revit Architecture 2011 and Revit 2017 with the IFC Exporter v17.3 installed. Instead of the “Property Sets” property group, select “Classification” to use your classification of the property. After running the check with the modified version of the rule, this rule passes since all doors do have an OmniClass Number defined.